Note: This ship was added on the HHC Server. Only little is known about the Osiris or her capabilities. The available data suggests that this is a joint project of the LSF and the Liberty Navy. 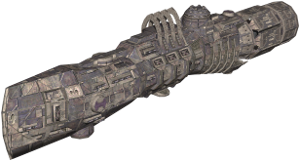 This is the single most powerfull ship on HHC, but it can only be bought by clans, that already possess a clanbase. It's also very vulnerable to Nova Bombs and can only undock from the Clanbase.